Oh my goodness you guys!!! These cookies are SO GOOD! They combine two of my favorite flavours, peppermint and chocolate. 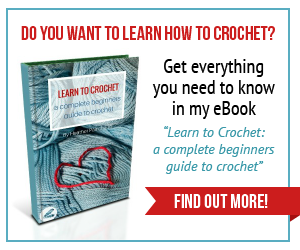 And the best part is that they are very quick and easy to make! 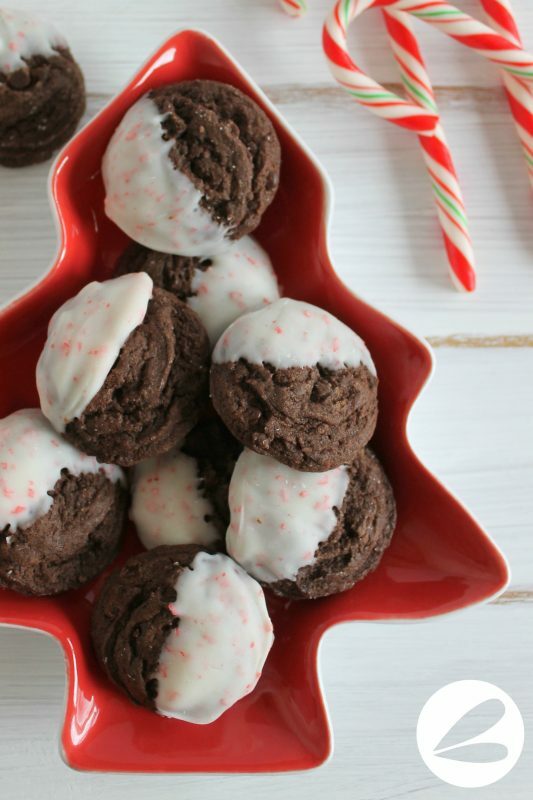 I have a lot of recipes that involve chocolate and peppermint. 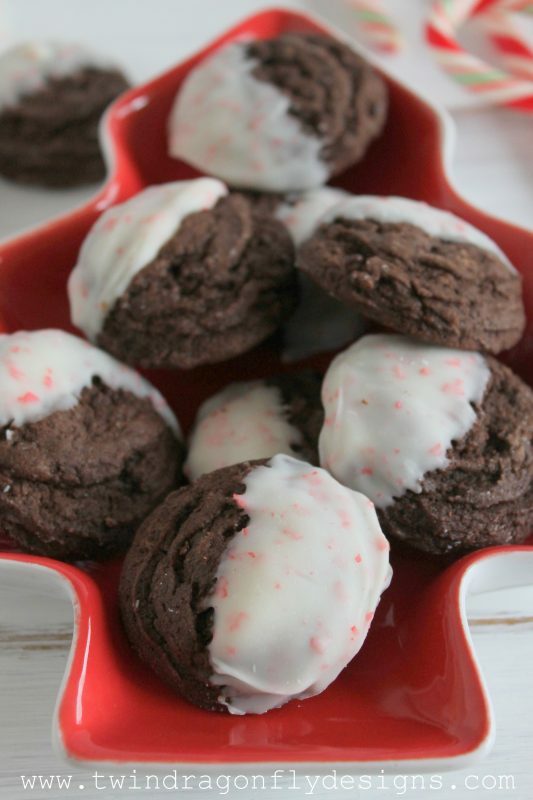 These Candy Cane Brownie Blossoms for example or these Candy Cane Brownies. But this Peppermint Dipped Chocolate Cookie recipe has quickly become my favorite because it is truly a quick process to create these cookies! Just mix, drop, bake and dip! In a large bowl beat butter, eggs, sugar and extracts until light and fluffy. Combine the flour, cocoa powder, baking soda and salt in a medium bowl. Stir into the butter mixture until well blended. Drop by rounded teaspoonfuls onto parchment lined baking sheets. When completely cooled, melt peppermint candy melts in a small microwave safe dish. 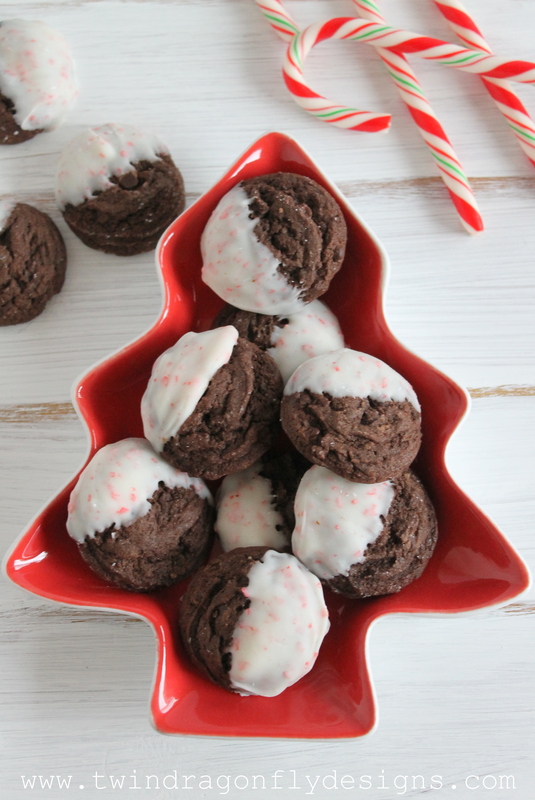 Dip cookies partially in chocolate and place on parchment paper to set. Its nice to have a treat to serve guests that looks this festive!!! These cookies have appeared for several years in our annual baking exchanges – thanks to Jen for the original recipe and Deanna who made a few modifications. I will be putting these lovelies on my “must bake list”. I simply love a cookie that doesn’t require rolling or cutting or decorating with icing. Are you with me? ?